Ohioans have a tremendous opportunity in 2018 not only to shape the future of our state for many years to come but also to send a message to the rest of America and the world. On Nov. 6, we have the chance to declare that the Buckeye State is still the heart of it all — that we reject the politics of division, corruption and chaos we are seeing in Columbus and Washington today, and that we embrace fairness, and community, and opportunity for everybody. 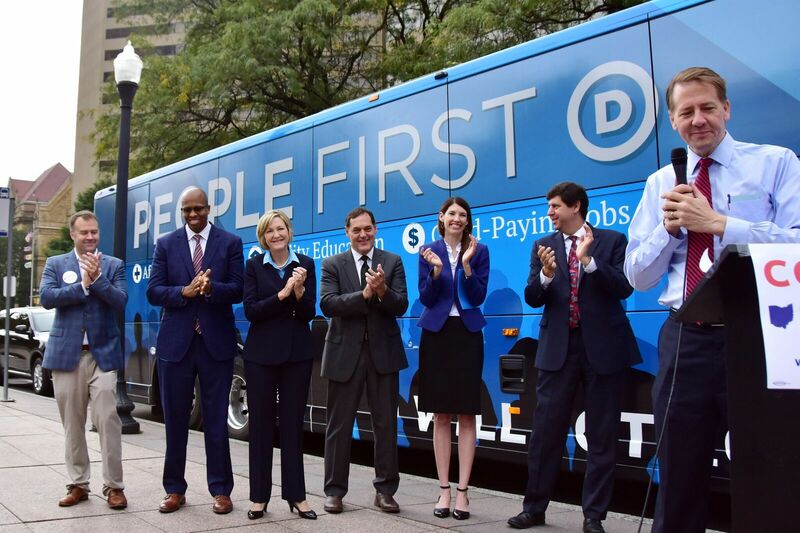 It’s time to put people first, and elect Rich Cordray and Betty Sutton, and Democrats up and down the ticket to make sure Ohioans have access to affordable health care, quality education and good-paying jobs. It’s time to elect leaders we can trust. If we can turn Ohio blue, retake the governorship, win Ohio’s other four statewide offices, and make gains at the Ohio Statehouse, it will send a signal that Ohio is a state that will take the lead and make change happen. Every election matters, but the 2018 election matters more than most. With the Ohio governor, secretary of state and auditor sitting on the redistricting commission, the results of those elections this year will reverberate in Ohio until 2031. And you can cast your ballot almost every day between now and Election Day — even on Saturday, starting on Oct. 27. For Attorney General, Steve Dettelbach will continue the work he’s done as a U.S. Attorney and a career federal prosecutor. Steve has vowed to stand up for the vulnerable and hold the powerful accountable. Auditor candidate Zack Space is running a hard-charging campaign to restore faith in Ohio’s broken political system. Zack is on a crusade to shine a light on the corrupting influence of money in politics, and to do his part to eradicate partisan gerrymandering in Ohio that results in political extremism and dysfunction. One of the most qualified Secretary of State candidates in Ohio history, Kathleen Clyde is a leading state legislator who has focused her entire career on protecting voter rights. Kathleen is committed to making sure our elections are secure, our districts are fair, our map-making is transparent, every voice is heard, and every vote is counted. Clyde recently attended a NAACP candidate forum in Cincinnati that her opponent said he would attend but never showed up. As Sherrod Brown often says, this election is about who you’re fighting for and what you’re fighting against. Rob Richardson, a longtime champion for workers across Ohio, is running for state Treasurer to bring accountability, innovation and opportunity back to the office. For the Ohio Supreme Court, Judges Melody Stewart and Michael Donnelly, are highly qualified, deeply passionate, and will help bring more balance to the court. They will work (as they have worked for years) to increase access, accountability, and transparency in Ohio’s criminal justice system. Find all the information you need to make your voice heard by voting early or on Election Day Nov. 6 at IWillVote.com/OH. Paid for by the Ohio Democratic Party.